Recent release “Timmy's Adventurous Summer” from Page Publishing author Marigayle Wallace is a vividly illustrated book that conveys to children lessons on friendship and compassion. 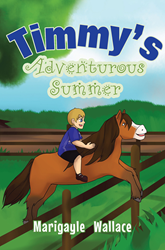 Marigayle Wallace has completed her new book “Timmy's Adventurous Summer”: a winsome story about Timmy, a young boy who enjoys the summer break together with his newfound friend Pony Pony. Published by New York City-based Page Publishing, Marigayle Wallace’s book also shows the lovable side of having animals for friends and the idea of caring for them. Readers who wish to experience this cherished work can purchase “Timmy's Adventurous Summer” at bookstores everywhere, or online at the Apple iTunes store, Amazon, Google Play, or Barnes and Noble.